a dual angled guitar pigtail and a dual straight guitar pigtail. Designed for use with the PedalSnake G2 system. The RS2 includes a dual angled guitar pigtail and a dual straight guitar pigtail. Use this for an effects send/return, a pedal setup that requires stereo or any application where more than one guitar line is needed. 15″ long. Guitar pigtail with one right-angled jack and one straight TRS jack.. Designed for use with the PedalSnake G2 system. Guitar pigtail with one right-angled jack and one straight TRS jack. 15″ long. use with the PedalSnake G2 system.22′, 4 Guitarlines, 2 Powerlines. Designed for use with the PedalSnake G2 system.22′, 4 Guitarlines, 2 Powerlines. Traditional one-piece construction, high-quality parts, handmade in the USA. use with the PedalSnake G2 system. Designed for use with the PedalSnake G2 system. 22′, 3 GLines, 1 PLine. Traditional one-piece construction, high quality parts, handmade in the USA. Designed for use with the PedalSnake G2 system. 20″ fanout at the pedal end and a 24″ fanout at the AMP END. 22′, 1 GLine, 1 PLine. Traditional one-piece construction, high quality parts, handmade in the USA. 2-pack of power pigtails, each with dual male ends. Designed for use with the PedalSnakeG2 system. The MM2 is 2-pack of power pigtails, each with dual male ends. 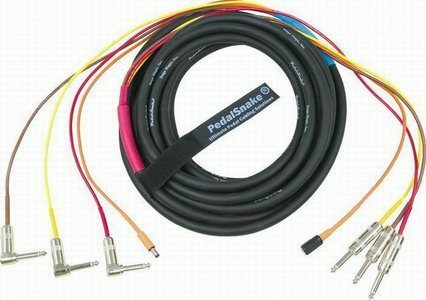 All PedalSnakeG2 pigtails are 15″ long. Perfect for Pedal Power 2, or similar power supplies. Designed for use with the PedalSnakeG2 system. Includes single PLine G2 pigtails: 2 single male G2 PLine pigtails. Both are 15″ long. Perfect for Pedal Power 2, or similar power supplies. your power supplies will still only use up one line on the PedalsnakeG2. Designed for use with the PedalSnakeG2 system. The MF2 is a 2-pack of power pigtails, one with dual male ends, and one with dual female ends. They particularly helpful if your pedalboard requires multiple power supplies to provide different voltages, like 9V and 18V. And the best part is your power supplies will still only use up one line on the PedalsnakeG2. 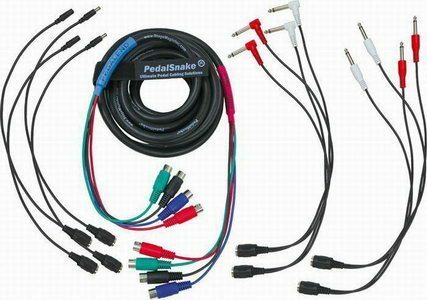 All PedalSnake G2 pigtails are 15″ long. a 2-pack of single male to single female power pigtails. Designed for use with the PedalSnakeG2 system. The MF1 is a 2-pack of single male to single female power pigtails. Efficiently brings power from your power supply through the PedalSnake to your pedalboard. Pigtails are 15″ long. eliminates all the cable mess between your stomp boxes and amp. 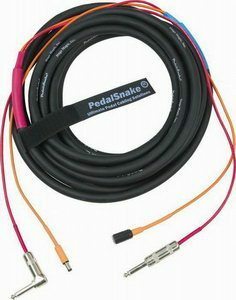 PedalSnake–the patented “all-in-one” FX pedal cable–eliminates all the cable mess between your stomp boxes and amp, saving you time and giving a super-clean stage appearance. 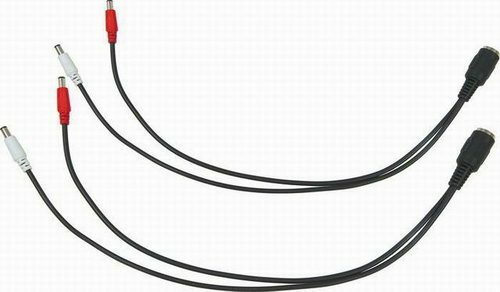 MIDI, footswitch lines, GuitarLines (GLines), and standard 2.1mm (like Boss) PowerLines (PLines) all come in a single flexible snake cable. A special shielding scheme ensures low-noise. PedalSnakeG2 is plug’n’play and easily adapts to rig changes. The G2 base snake is 22′ long and has 4 color-coded channels with 5-pin MIDI-type connectors. G2 pigtails plug directly into the G2 base snake channels. PedalSnakeG2 MIDI is 5-pin, 3-wire with no phantom power (MIDI3). To use a G2 channel for MIDI, just leave the pigtails off. Set includes PedalSnakeG2 plus 2 dual right-angle guitar pigtails, 2 dual straight guitar pigtails, 2 male power pigtails, and 2 female power pigtails. 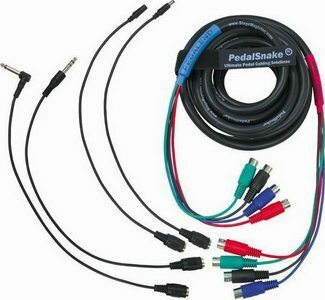 A special shielding scheme ensures low-noise..
PedalSnake–the patented all-in-one FX pedal cable–eliminates all the cable mess between your stomp boxes and amp–saving you time and giving a super clean stage appearance. MIDI, footswitch lines, GuitarLines (GLines), and standard 2.1mm (like Boss) PowerLines (PLines) all come in a single flexible snake cable. A special shielding scheme ensures low-noise. PedalSnakeG2 is plug’n’play and easily adapts to rig changes. The G2 base snake is 22′ long and has 4 color-coded channels with 5-pin MIDI-type connectors. 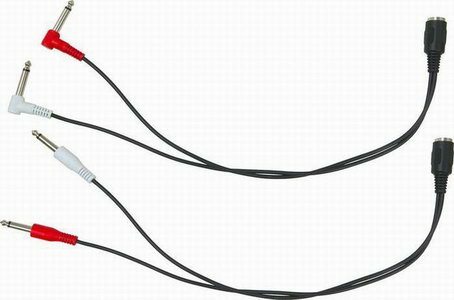 G2 pigtails plug directly into the G2 base snake channels. PedalSnakeG2 MIDI is 5-Pin, 3-wire with no phantom power (MIDI3). To use a G2 channel for MIDI, just leave the pigtails off. Set includes the G2 plus one Guitarline pigtail and one Powerline pigtail.